In August 2018, 4.8% fewer single-family homes were listed for sale in New Tampa than in August of 2017. Compared to July 2018, listings fell 10.5%. The number of homes that sold fell 6.4% year over year and 8.1% month over month. The number of under contract listings jumped 9% compared to last month and 29.8% compared to last year. The Months of Inventory, which measure the available supply of homes for sale, came in at 2.3 months, the same as in 2017. 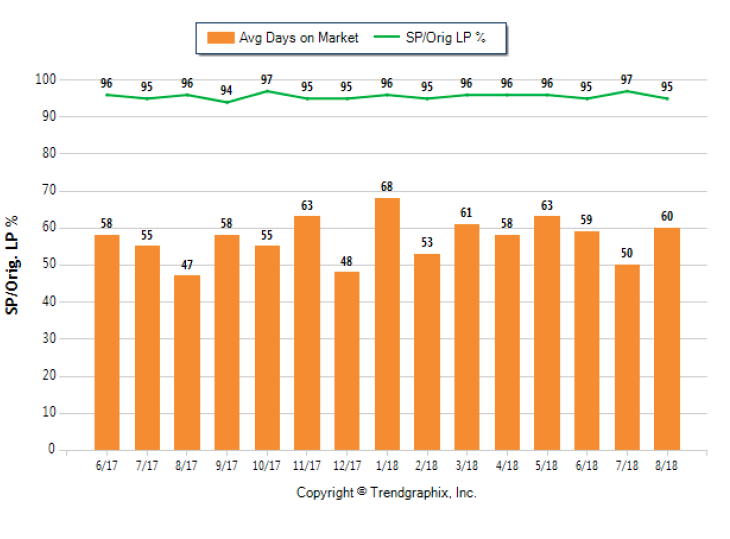 The Average Days on Market showed a neutral trend, increasing 27.7% compared to August 2017. The ratio of Sold Price vs. Original List Price was 95%, 1% lower than last year. 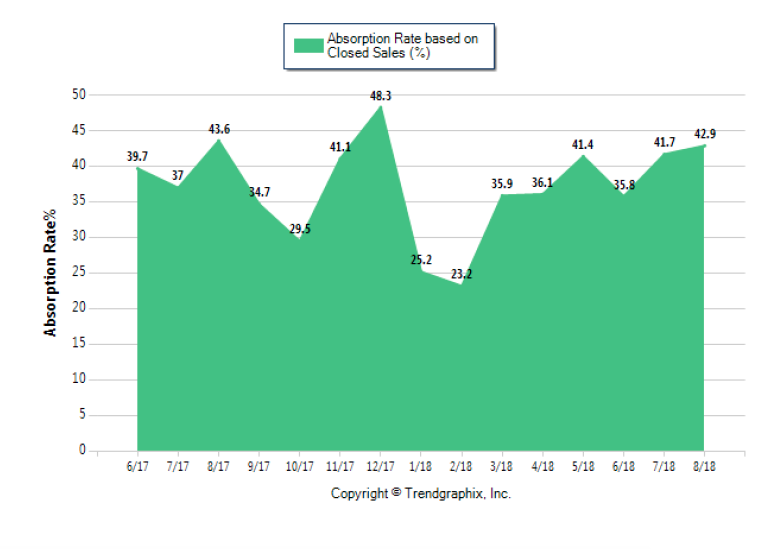 In August 2018, 102 homes sold, 6.4% less than the 109 that sold in August of 2017 and 8.1% lower than the 111 sales in July 2018. The total number of homes for sale fell by 12 units or 4.8% compared to a year ago and 10.5% compared to a month ago. Homes under contract (pending) increased by 9% compared to last month and 29.8% compared to last year. The Average Sold Price per Square Footage indicates the direction of property values. In August 2018, the Average Sold Price per Square Footage was $125, down from $131 in July 2018 and 1.6% from $127 in August 2017. The average Days on Market (DOM) shows how many days, on average, homes stay on the market before they sell. 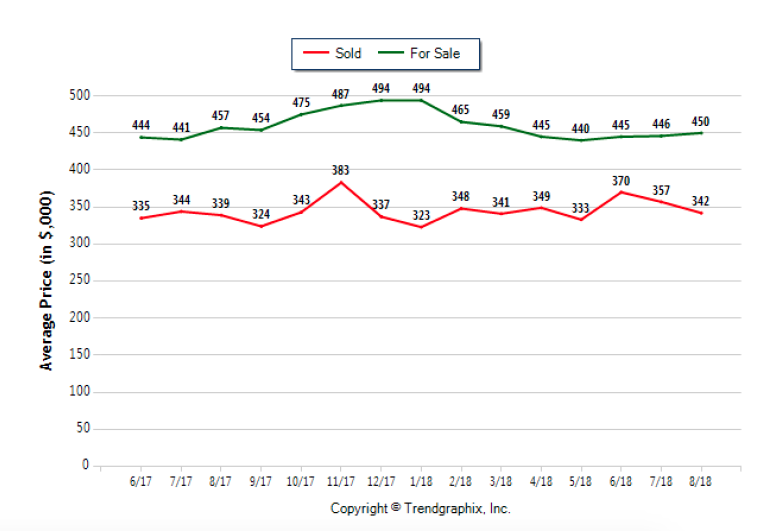 If this measure trends upward it indicates a move towards more of a Buyer’s market, but if it trends downward it indicates a move towards more of a Seller’s market. The DOM for August 2018 was 60, up 20% from 50 days last month and up 27.7% from 47 days in August of last year. The Sold Price vs. 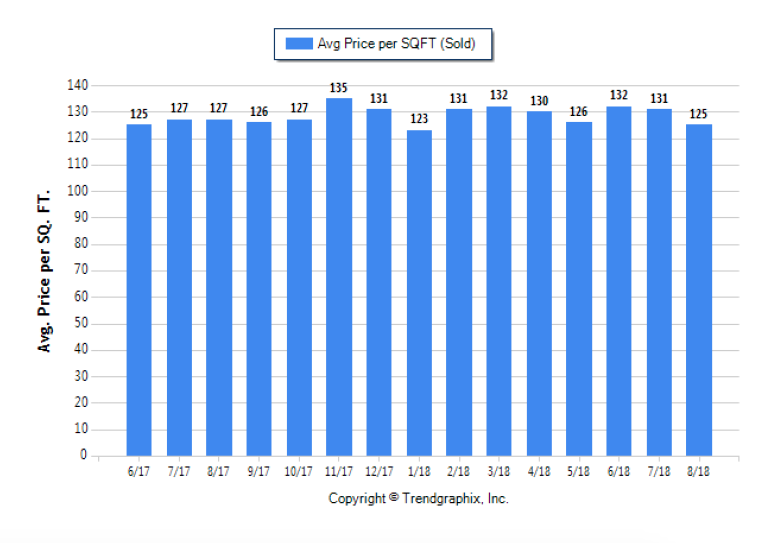 Original List Price shows the average amount that sellers are decreasing their original list price. The lower the ratio is below 100% the more of a Buyer’s market exists, a ratio at or above 100% indicates more of a Seller’s market. This month Sold Price vs. 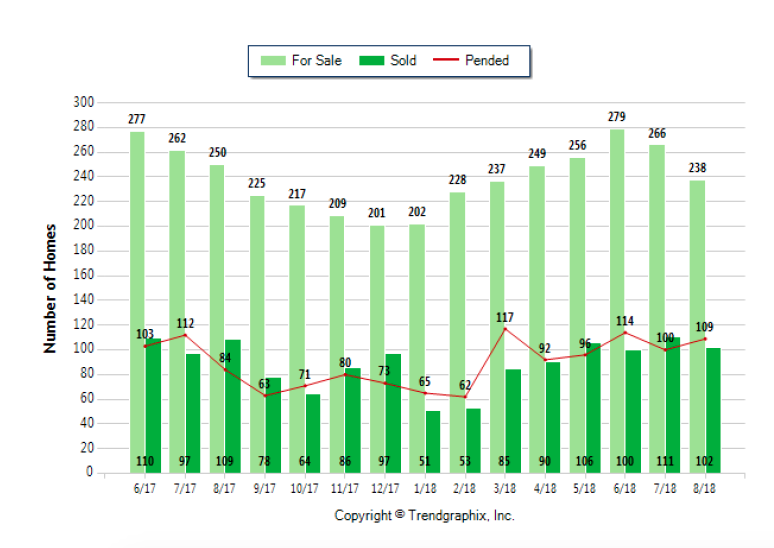 Original List Price held fell 2.1% to 95% compared to last month. It was also down 1% from last August. The Average For Sale Price in August of $450,000 increased 1.5% from $457,000 in August of 2017. It ticked up 0.9% from $446,000 in July 2018. The Average Sold Price in August of $342,000 rose 0.9% from $339,000 in August of 2017. It fell 4.2% from $357,000 last month. 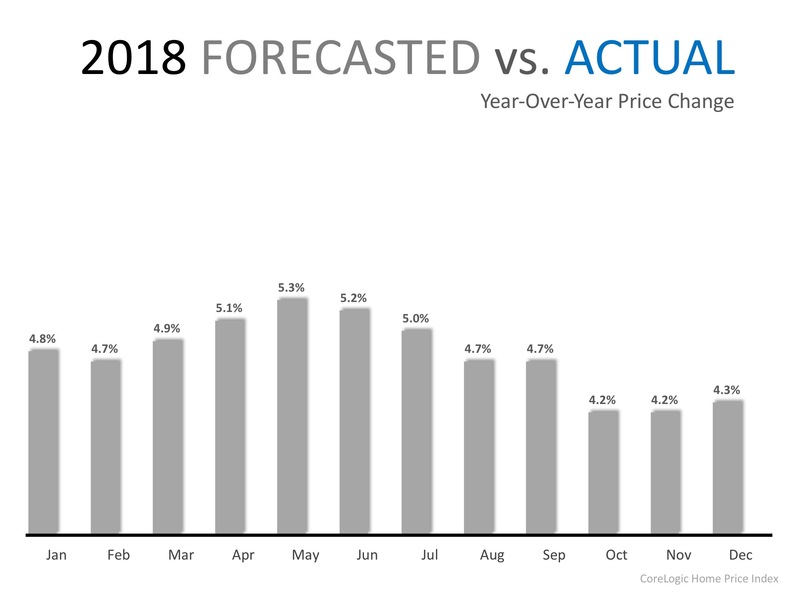 The Median Sold Price in July was $332,000, up 8.9% from $305,000 in August of 2017 and 3.1% from $331,000 in July 2018. 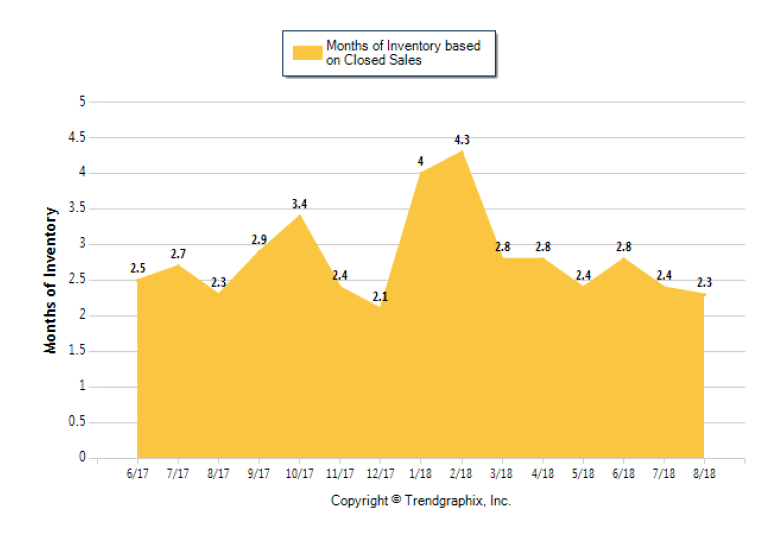 The August 2018 Months of Inventory of 2.3 months was the same as last year and down 4.2% compared to last month. The August 2018 Absorption Rate was 42.9%. This was a 1.6% decrease compared to August 2017 and 2.9% increase compared to July 2018. Which Tampa Bay ZIPs had the priciest, least expensive and most house sales in 2017? If you bought or sold a house in Tampa Bay last year, you were a player in one of Florida’s hottest real estate markets. Even though prices eased a bit from their torrid pace in 2016, the median cost of a single family home shot up 11 percent. That’s more than in Orlando, Jacksonville and a big swath of South Florida from Miami to West Palm Beach. And it’s more than for the state as a whole. “Tampa Bay is a really strong market in terms of price appreciation,” said Cheryl Young, senior economist for the online real estate site Trulia. 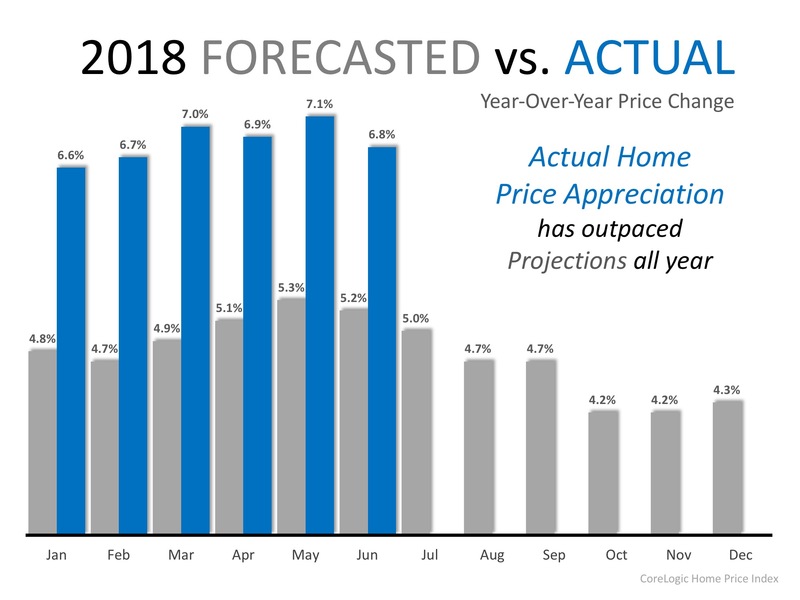 She predicts prices will climb another 7 percent this year if newcomers continue to pour into the area, job growth remains strong and unemployment stays below the national average. For Tampa Bay overall in 2017, the median price of a house hit $220,000, the highest in at least a decade. But a breakdown of sales by ZIP Code shows that several of the most active ZIPs had median prices that were considerably lower. That indicates affordability continued to be a key factor for many buyers. Selling your home, even for the most organized person, is a stressful experience. There are things to be repaired, rooms to be cleaned, and often children and pets that don’t understand all of the increased activity. And to top it all off, you have to open up your home to complete strangers who are going to walk through every part of your personal space. 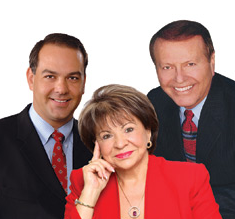 Luckily, one of the many benefits of using a REALTOR is the peace of mind knowing that through their expertise and available technologies, you can rest at ease, assured that your family and your personal property are safe during the home selling process. Following are a few safety considerations for sellers. 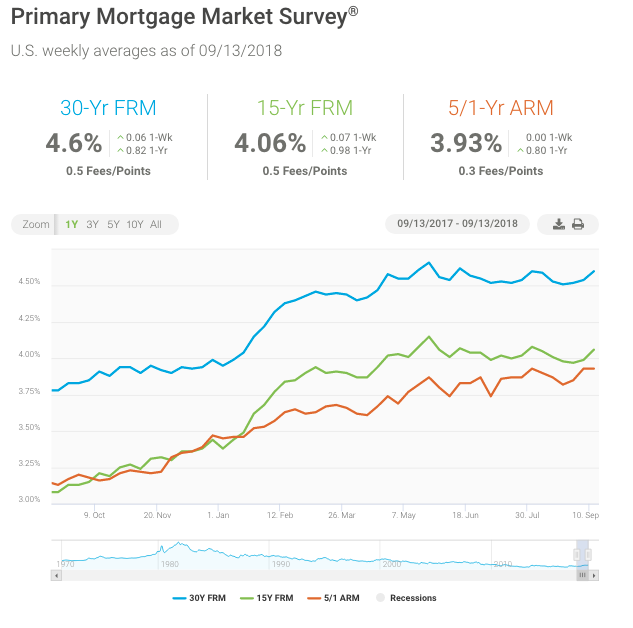 The one-two punch of strong job and consumer credit growth drove mortgage rates up to their highest mark since August 2. Mortgage rates are currently 0.82 percent higher than a year ago, which is the biggest year-over-year increase since May 2014. Looking ahead, annualized comparisons for mortgage applications may look weaker than they appear, but that’s primarily because of the large spread between mortgage rates now and last September, which was when they reached their low for the year. Overall, this spectacular stretch of solid job gains and low unemployment should help keep homebuyer interest elevated. However, mortgage rates will likely also move up, as the Federal Reserve considers short-term rate hikes this month and at future meetings.